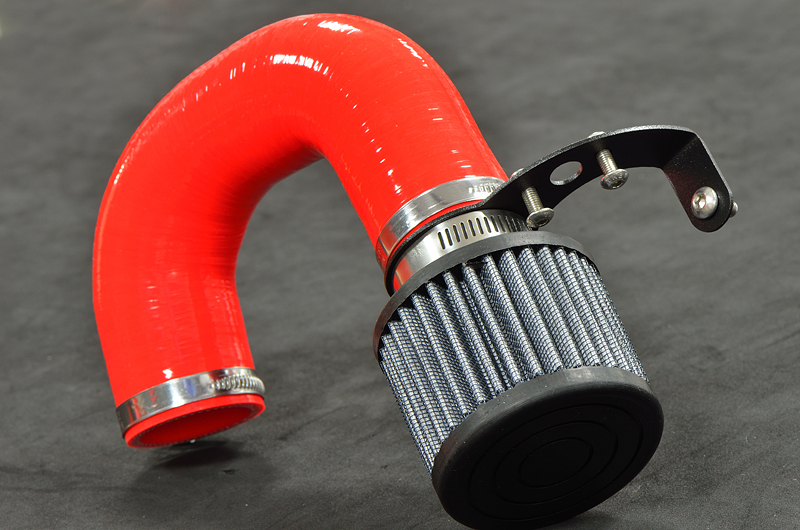 Our Honda Grom Intake (Mtake) offers a huge boost in torque over throttle body mounted filters. Big power in a clean and easy to install design. Air temp sensor mount incorporated into the powdercoated bracket. Our proprietary spec silicone hose and filter are made in the USA. Includes stainless mounting hardware. Tight fit, awesome look and great sound! Couldn’t be happier with my purchase. I ordered the pre filter, shroud brace and the case breather filter as well and recommend it to all. I ride in all conditions including mud and the pre filter does exactly what I wanted it to. Easy to install once you get most of the fairings off. I’d recommend to anybody buying this intake to buy the whole kit. You need the other filter and if you’re planning on doing some even some minor off-roading, buy the pre filter! There is no provision on the mtake for the air temp sensor. What are we supposed to do with that? Apparently we’ve failed you in communication…. Accommodation for the sensor is designed into the bracket itself, and hardware is provided, allowing totally unobstructed flows into the engine. Perfect form and function. If you have any questions at all, shoot us an email and we’ll walk you through that simple process. Easy to install. Fits well. Should give the little engine all the air it wants! Looks nice. Fitment was great. Just make sure the sensor bracket is on the right way around and it will line up. Mine came backwards but it pops right off and is easy to flip around. Get the accessory kit with it. The pre filter and brace are worth it.